HOUSTON (AP) — A fire at a Houston-area refinery has been extinguished after it sent a large cloud of dark smoke over a wide area of southeast Houston. Houston Fire Department Senior Capt. 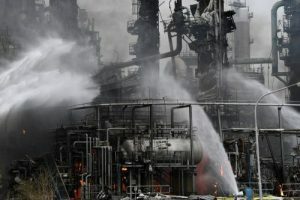 Ruy Lozano says no injuries have been reported in the blaze that broke out late Friday morning at a LyondellBasell plant. Flames were extinguished within about an hour. Company spokeswoman Pattie Shieh says the fire originated in a processing unit known as a coker unit. LyondellBasell describes the plant as one of the nation’s largest refineries to process heavy-sulfur crude oil into clean fuels including reformulated gasoline and low-sulfur diesel, along with heating oil, jet fuel and lubricants. The plant is among dozens that make up one of the world’s largest petrochemical complexes along the Houston Ship Channel.